One Momma Saving Money: SOL REPUBLIC Tracks On-Ear Interchangeable Headphones on sale for $29.99 (was $99.99) + Free shipping!!! 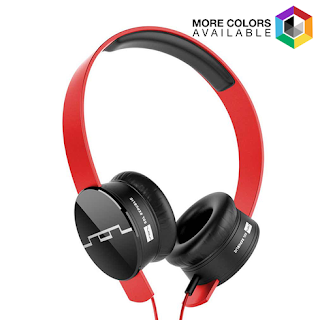 SOL REPUBLIC Tracks On-Ear Interchangeable Headphones on sale for $29.99 (was $99.99) + Free shipping!!! Sol Republic’s 1211-03 Tracks On-Ear Interchangeable Headphones with 3-Button Mic + Music Control, feature V8 sound engine speakers. Tracks can be remixed with a stylish selection of switchable cables and headbands. Fully loaded with deep bass and high clarity, you can feel the full power of your music. The SonicSoft Speaker Pads with extra-wide, noise-isolating ear cushions let you enjoy your music in comfort for hours. Constructed of polymer compound, the FlexTech Sound Track headband is built to withstand heavy abuse. Twist it, bend it, drop it, these headbands are virtually indestructible. The 3-button mic + music control lets you adjust the volume, pause/resume/skip music and answer/hang-up calls. Plus, the high clarity mic captures every word.